Presenter: Kevin Healey Kevin Healey hears voices and has done so for longer than he -or they -care to remember. 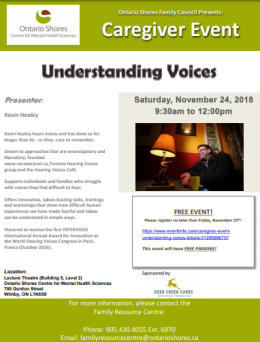 Drawn to approaches that are emancipatory and liberatory; founded www.recoverynet.ca , Toronto Hearing Voices group and the Hearing Voices Café. Supports individuals and families who struggle with voices they find difficult to hear. Offers innovative, taboo-busting talks, trainings and workshops that show how difficult human experiences we have made fearful and taboo can be understood in simple ways. Honored to receive the first INTERVOICE International Annual Award for Innovation at the World Hearing Voices Congress in Paris, France (October 2016). FREE EVENT! Please register no later than Friday, November 23th FREE PARKING! This entry was posted in Event, Healing, hearing voices, Ideas, Trauma. Bookmark the permalink.